This item includes the Venice Sofa Bed frame only, a futon mattress is not included. This frame is available as a full or queen size in a cherry, honey oak, or java finish. If you are looking for a mattress, please see our Futon Mattresses section for Wolf & Otis brand premium quality mattresses. The Venice frame can also be special ordered in Chair and Lounger sizes. Please contact us for details. The Venice Frame is beautifully finished and features a high-end elaborate design with state-of-the-art construction assuring strength, performance, & durability. The frame's support system allows you to quickly convert between Sofa, Recliner and Bed positions in seconds.. The Venice Futon Frame features sleigh-style armrests and solid panels with tongue-and-groove design. 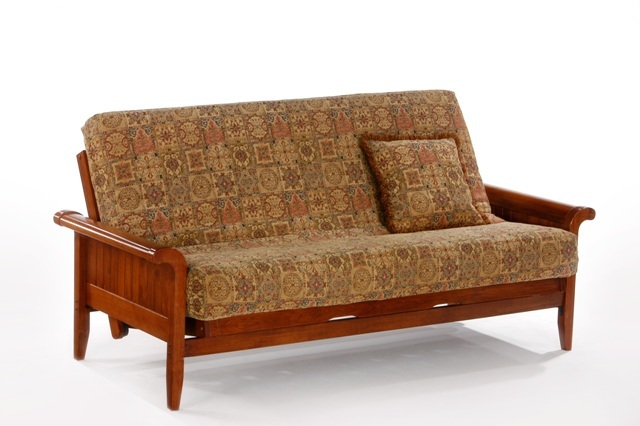 Constructed with plantation grown rubber-wood and expert craftsmanship, the Venice Futon Frame will compliment any living room with the most elaborate style in the industry. We ship your Portofino Frame via UPS Ground or LTL Freight with tracking. Most orders ship out within 24-48 hours.